Photography and Journey. Colors of the Cote d'Ivoire. Colors of the Cote d'Ivoire, June 2008. Termite mound, Malian border region. Yamoussoukro, Basilica of our Lady Peace. 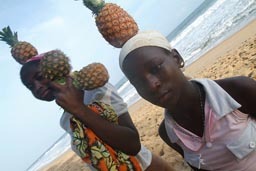 Girls on Grande Bassam beach, pinaples on their heads. 2008 06 10 Yamoussoukro - San Pedro to Abidjan to Yamoussoukro to Bamako. Apart from the usual Castel and Flag of West Africa, there is BOCK beer Solibras in 65cl bottles, or even 1l. I don't like it much. "Pour les hommes forts" it says in the ad. Cheap local brew.